Having recently finished a series of posts critiquing someone else's critique of Homeopathy (Wikipedia), I am left with a clearer picture of some of the questions and misconceptions people have on the subject. Homeopathy is the therapy (-pathy) of similars (homeo-). We use the substance that causes symptoms that most closely match the disease symptoms to stimulate the body to remove those symptoms (all of those symptoms, and therefore the disease). It's just good medicine! Give only as much as is needed to stimulate a healing response. Simple. Corollary #2 - Central Disturbance: For the most part, the above-described phenomenon suggests that disease results from some sort of central disturbance that then manifests outward symptoms. If this central disturbance is corrected, the body will then be able to redress the various symptoms and cure the disease. Corollary #3 - The Vital Force: If there is a central disturbance caused by disease, there must be something that is actually disturbed, no? That is what the founder of homeopathy called "the vital force," or "dynamis." This concept might well be understood now as "allostasis," or the ability of our organism to maintain the balance that keeps us alive. Corollary #4 - Drug Testing: In order to know what substance produces symptoms most similar to the disease in question, many substances have to be made into homeopathic remedies and tested on healthy volunteers. Then, when somebody gets sick, we can match their symptoms to a previous drug "proving" (trial) or to cured clinical symptoms to find the most similar remedy. Dr. Samuel Hahnemann, the founder of homeopathy, is considered in conventional medicine the father of drug testing (and of hygeine). He insisted that no medicine should ever be used on the sick that has not first been tested on the healthy. Corollary #5 - Susceptibility: Each organism has its own patterns of susceptibility. Even when a disease as virulent as smallpox roamed the land, not everyone caught it. And not everyone who caught it died. We are each susceptible to different influences, whether they be prepared medicines or disease influences, and the more precise the match between a medicine and a disease state, the more susceptible the organism will be to that medicine. 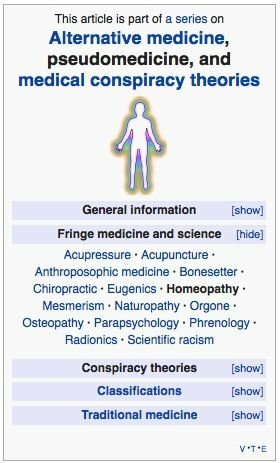 Wikipedia on Homeopathy: Is it over yet? ?